The first Thursday of each month is Print competition night. The second Thursday of each month is Projected Image competition night. Read the Member Guide for an explanation of competition categories, guidelines, and print submission. Save a copy of each image for submission purposes, so that your original images remain untouched. Reduce the size of each copy so that the width is no larger than 1920 pixels and the height is no larger than 1200 pixels - however within these limits the image should be as large as possible (the larger dimension must be at least 1000 pixels). If the image is not already in jpeg format, convert it to jpeg. 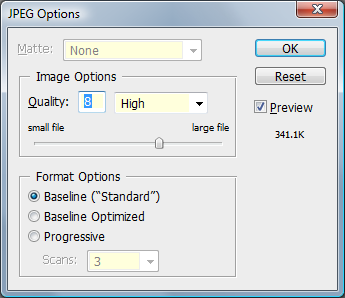 In the JPEG Options dialog box (if using Photoshop) pick a "Quality" of 8. In any other tool, choose a jpeg compression level such that the image takes up less than 4 MB of disk space. Login by clicking on the Login link in the upper right hand corner (if you are not already logged in). Go to "My Photos" on the left-hand menu. You will see a list of competitions. Click on the name of the competition you want to submit photos for (e.g. "March Projected"). You will see a list of categories for the competition. Click on a category (e.g. "Pictorial") to sumbit images for that category. The rest is fairly straightforward. You do not need to worry about file name conventions - each file you upload will be renamed appropriately. Please upload your images by 10pm the night before the competition. Shortly after 10pm, the competition will be "frozen" and no more images will be accepted.